Conveniently mounts to king pin box on all fifth wheels fore ease of viewing from driver's seat. 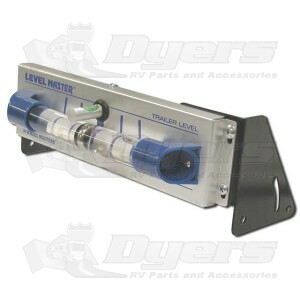 Level Master Can Be Viewed From The Driver's Seat To Help Locate The Best Level Location For Parking Your RV. Each Mark On The Side-To-Side Scale Indicates One Inch Of Blocking. Front-To-Rear Scale Is Adjustable And Can Be Easily Viewed While Operating Your Tongue Jack. Complete kit includes Giant Level, adjustable brackets and hardware. An absolute must have. I do not use a level inside of my 5th wheel. This has been the best and easy way to level my camper. No running back and forth from the front of the camper to the kitchen counter top to check. Just like the infomercials say "Set it and Forget it." Just make sure when installing the new level to make sure your camper is perfectly level. Kind of foolish to mount a level on your camper and when it is not level. Good luck & Happy Camping!!! Life it what you make of it.